What Car Should Have Been Built As A Station Wagon? Blame it on our love of all things station wagon, but after stumbling across this custom Cadillac station wagon we couldn't stop thinking about the wagons that should have been. This weekend we want to know what vehicle you think should have left the factory as a station wagon? Perhaps you've seen a one off custom coachbuilt example and dreamed of having one without the one off custom price tag. Maybe you just know a certain car would look good as a wagon even if you've never actually seen it done. Either way tell us about the car you wish had been built as a wagon. This one is simple for me, I wish the E28 5 series BMW had been built with a wagon option. 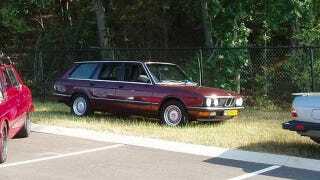 While a few were put together by custom coach builders, the E28 never left a BMW factory as a station wagon. With lucky E30 3 series enthusiasts counting days until they can start importing 25 year old station wagons, I can only wish importing a euro E28 wagon was a reasonable and somewhat affordable option.